Veselka Bowery ClosesBut the original location is still serving borscht 24/7. The Nature Theater of Oklahoma Scores Brownie Points With AudienceIt’s like dinner theater. Free Cocktails at the Roger Smith Hotel; Bobo Closes Over Health Violations ThenPlus: Nublu expats camp out at Lucky Cheng’s, plans for a vegan bodega, and more, in our daily roundup of neighborhood news. Little Veselka Says See Ya; Mars Bar Preps Its Own DepartureTwo closings in the East Village. TV Parties Tonight: Colbert Report Shoots at Bar Coastal, Man v.Set crashers, get ready! Veselka May Waddle Away From KioskNo more bathroom breaks at Katz’s, the city tells Veselka workers. Mars Bar May Be Bowery’s ‘Final Blow,’ But Veselka Opens inNow this is going to throw the nostalgia bloggers for a loop. Veselka Does Fine With ‘B’; Joe Biden, Hot-Dog VendorPlus: Jamba Juice adds coffee, and hearts are the new hip offal, all in our morning news roundup. Pies-N-Thighs Shows Signs of Life; Park Slope’s Hidden RestaurantPlus: Construction begins at Veselka Bowery, find a rare Italian wine in Fort Greene, and more in our daily roundup of neighborhood news. 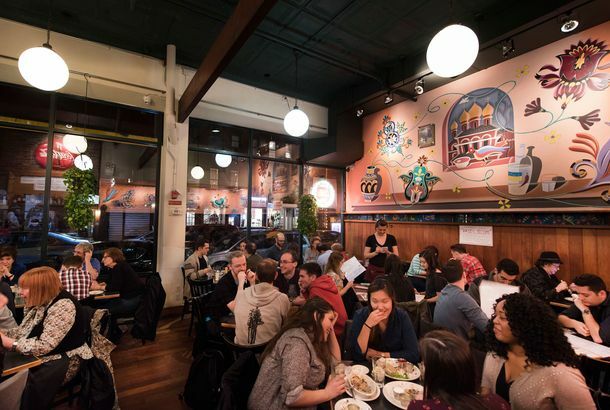 Veselka’s Mural Can Be YoursThe restaurant is planning to expand, and Arnie Charnick’s painting needs to go. Pierogi PlacementHas business picked up at Veselka since it was featured in ‘Nick and Norah’s Infinite Playlist’? The Return of Aquavit’s Crawfish Week; BYO Toppings at South BrooklynA pizza truce in Sunset Park, and more evidence to suggest Veselka’s burger is serious, in today’s neighborhood food news. Veselka Expansion Back On, Liquor License or NotThe community board can do what it wants, but Veselka Bowery is heading this way. Model Agyness Deyn Is No Longer Weirded Out by Pancakes With Scrambled Eggs Agyness Deyn — a Manchester, England, native who is the face of Armani and who last month appeared on the cover of Vogue when the magazine named her one of “The World’s Next Top Models” — got tired of crossing the pond for work and, as of a few weeks ago, is now a full-time New Yorker. It has taken some adjustment: “It kind of freaked me out at first how much everyone eats out,” she says. “At home we’d go out for food one night on a weekend. Here I’m eating out every single meal. It’s really bizarre.” To find out just how bizarre, we asked her to recount everything she’s eaten recently. Veselka 2: Electric BoogalooVeselka, an East Village mainstay since 1954, may soon have a twin: Owner Tom Birchard says he wants to open another full-scale restaurant. (Little Veselka, the Houston Street takeout kiosk, opened last year.) He’s looking at several downtown locations, the Avalon Christie complex on East Houston Street among them — the same building Daniel Boulud is thinking of dropping a new place into. But if Birchard had his druthers, he’d head uptown. “The ideal neighborhood would be the Upper West Side, around Columbia,” he tells us. “But I don’t want to be spending an hour going there and back every day. That would just be the most logical place, in terms of what’s there and who my customers would be.” Wherever he goes, the kasha king is sure of one thing: “I am going to re-create the Veselka we’ve had here for 53 years.” Well, sir, you can certainly try. The Tasting Room Now Accepting Coupons Lugging a dining guide around is so last millennium — these days it’s about Grub Street on your Treo — but there’s a certain usefulness to the Dining Deck, a pack of cards that blurbs 52 different restaurants, as well as providing $10 coupons for each one. This holiday season brings a new Downtown Diner’s version, featuring restaurants like the Tasting Room and Veselka (and, d’oh, the now-kaput Blue Mill). There’s also a Bar & Lounge deck for East Village pub crawling, which suggests a creative use: Since the box resembles a pack of cigarettes when pocketed, it could make a fine icebreaker: “Actually, I don’t smoke — but can I treat you to a Cosmo?” — Daniel Maurer Purchase online or visit City Shuffle’s booth at the Union Square Holiday Market. New York Burger Co.’s Dirty SecretNew York Burger Co. has two profitable locations in the city that have won some praise, so naturally, the company’s founders are poised to make the leap into megafranchising. We’ve often wondered at burger joints that are obviously created as franchise pilots; Long Island’s American Burger Company didn’t even bother giving itself a local name before initiating its nation-conquering mission.